In late August, I was lucky enough to spend time exploring the art and culture of London and Paris. As a museum educator, my main goal (of course) was to fit in as many museum and cultural site visits as possible–and I tried my best! While I was mesmerized by the popular artistic highlights of these cities–who doesn’t treasure seeing a Da Vinci first-hand? ?–for this post I wanted to share some images that were particularly special to me, as they showcase some overlooked sites and scenes from these fascinating cities. Open ceiling in a gallery of the Victoria & Albert Museum. Stonehenge was breathtaking, but the clouds almost stole the show. Thatched roofs on replica neolithic houses at Stonehenge. “Horse in Motion” by Eadward Muybridge. Absolute fav. Early foray into motion photography. Interactive exhibit at the Centre Pompidou’s Children’s Gallery. All hands on ship! Underside of Le Tour Eiffel. New view of Leonardo Da Vinci’s “Mona Lisa.” One where no one is actually looking at it. *For more information on Thomas Thwaites’ project (which is fascinating!) click here. Perhaps my favorite art educational gem from the entire trip was stumbling upon the Musee D’Orsay‘s crowdfunding restoration project of Gustave Courbet’s The Painter’s Studio. The artwork is being restored on-site in the Museum’s exhibition space and visitors can view the progress in-person over many months, and through various interactive technologies. 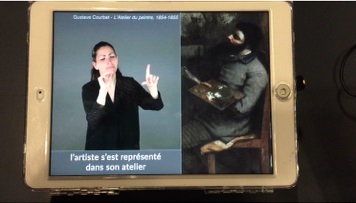 The most exciting technological component, in my opinion, was a French Sign Language (LSF) interpreted description of the conservation work–fascinating and accessible! As with most trips overseas, mine was much too short and there were many, many things still left unseen. It was a magical trip and an unforgettable experience, which caused me to stop and think about the unexpected treasures that can be found on visits to popular and familiar places–and I hope you will too!